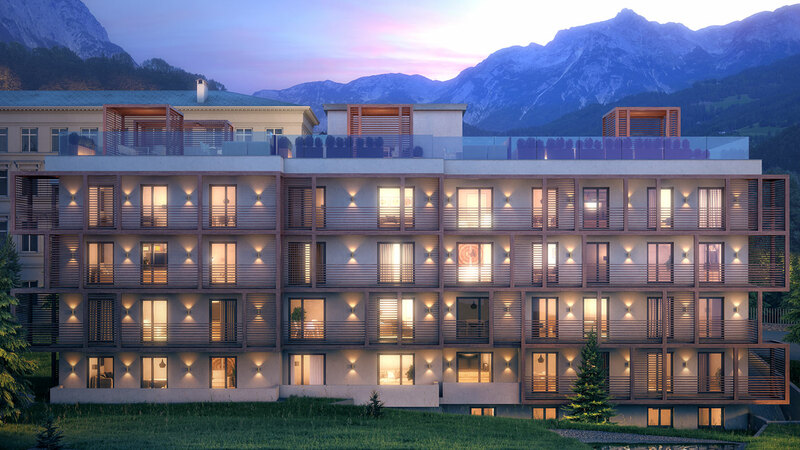 Residences at the Hard Rock Hotel Davos demonstrate the best of Swiss style, quality and efficiency with architecture and interiors by the internationally acclaimed Woods Bagot. 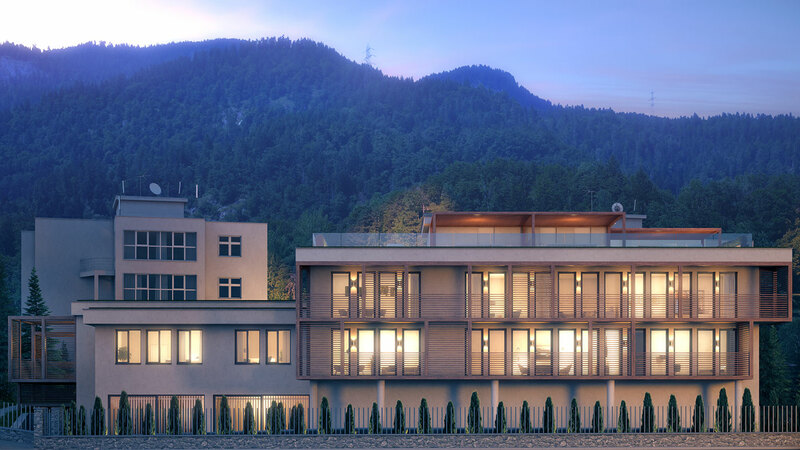 Located in three buildings, connected via underground corridors, residences include spacious one- and two-bedroom apartments, ranging from 60m² to 131m². Architecture and interior design are exquisitely planned to maximise natural light and bring nature to the forefront. Balconies offer generous outdoor spaces, while views are breathtaking through oversized windows. Interior spaces provide both form and function, with modern furnishings and top quality specifications creating a welcoming, cozy and relaxing place from which to enjoy the Alpine location and Hard Rock’s legendary service and signature amenities. 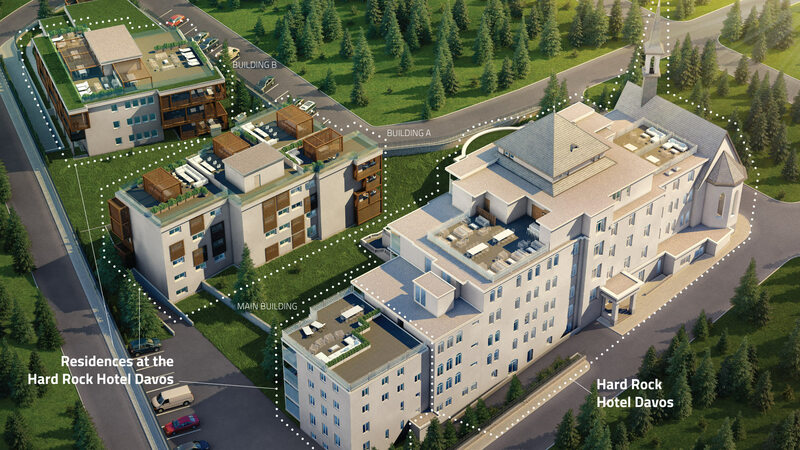 Our apartment complex consists of three buildings that are connected indoors via underground corridors, and have a total floor area of 2,700m². The apartment owners at Residences enjoy all the advantages of being a Hard Rock Hotel Davos habitué and a welcomed guest, with full access to the hotel’s signature amenities; Rock Spa®,Body Rock®, three meal restaurant, lively lobby bar, roof top cocktail bar offering fantastic views of the surrounding area, function rooms, private parking and ski room. There are 7 residences in the main building across 4 floors: floor -1, ground floor, floor 1 and floor 2. 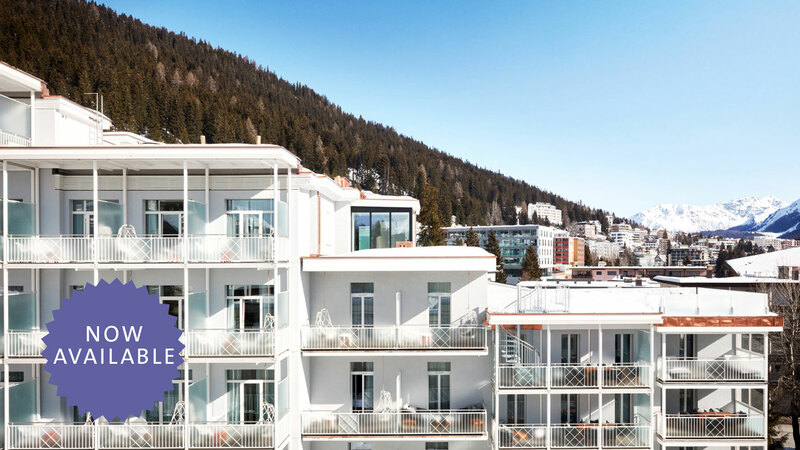 This is the main Hard Rock Hotel Davos building with bars and restaurants, meeting areas and event spaces all here for you. 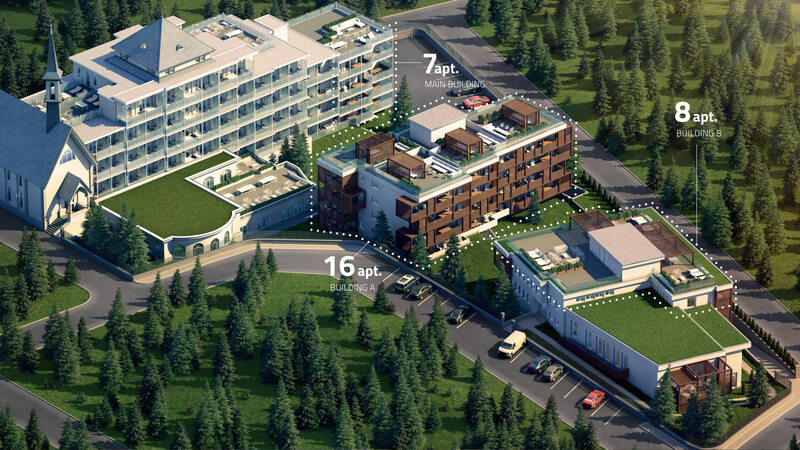 Building A offers 16 apartments in a separate block, connected via underground corridors to the other buildings. Residences are across four floors: ground floor, floor 1, floor 2 and floor 3. There are 8 apartments in Building B, also connected via underground corridors to the other buildings. Residences are across two floors: ground floor and floor 1. The Rock Spa® is in this building, with its pools, sauna, steam room, gym and world class spa treatments.